Though the first rule of Meat Club is not to talk about Meat Club, that rule needs to broken or else there will be nothing to write about, and you will never know about all the delicious products the Providence artisanal purveyors want to give you each month. Sign up and you'll receive six collections throughout the year featuring three meats, two condiments, and notes from the chef and charcutier detailing how they would serve the meats (and hopefully asking you deeply personal questions). 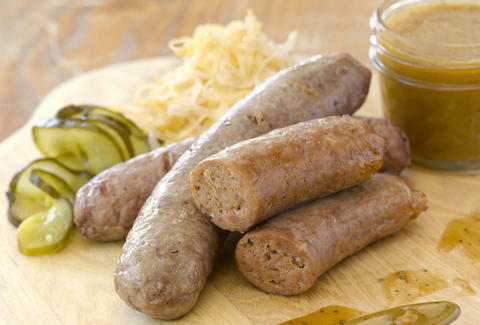 Handsome examples include Summer shipments of beer brats, salsiccia Calabrese, something called Loukaniko, which Google claims is a Greek sausage flavored with orange peel, Baboo's mustard, and housemade bread & butter pickles. Or there's a February basket with corned beef hash, applewood smoked bacon, apricot bacon jam, honeyed butter, and "Rhody scrapple", which you can take down all at once, if you feel like destroying something beautiful.